Top CIOs Compensation starts at $1.9 million - Janco has just completed its review of the top paid CIOs in publicly traded companies. Two of the individuals who were on the list last year have had their roles expanded so they have more than IT within their scope of responsibilities. Some of the individuals in the this years list also have broad operational responsibilities. If they are successful this year they will be excluded from next year's list. 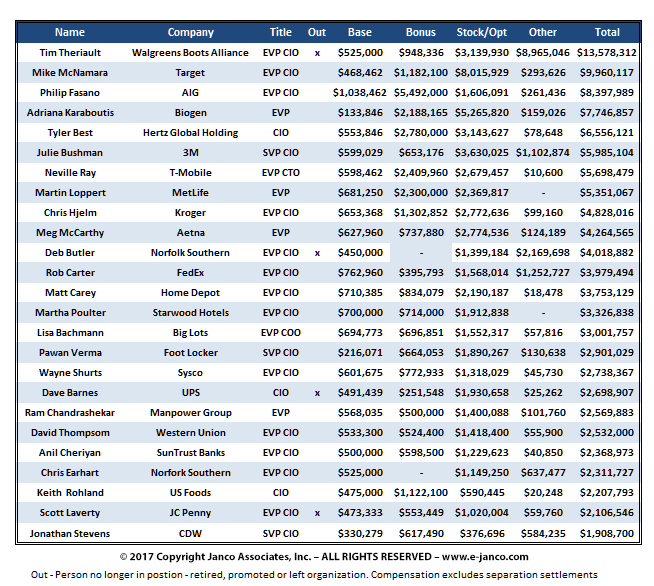 In a review of public records Janco has found that 25 CIOs make over $1,900,000 and the top paid CIO made $13.7 million (Tim Theriault - Walgreens)). 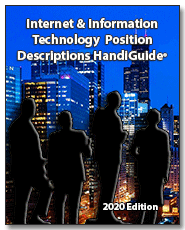 Most of the compensation for the CIOs come in the form of company stock and stock options . The highest base compensation was $1 million for Phillip Fasano at AIG. Both visionary and pragmatic - It is not enough to plan for innovation, the CIO needs to be perceptive and realistic. As an insightful manager, a CIO promotes broad technology agenda to help the business profit from leading-edge initiatives. At the same time as a pragmatist, a CIO deals with the realities of the business. The pragmatist also facilitates the productivity of current IT solutions. The CIO focuses on minimizing cost and maximizing results, in addition the CIO helps to increase the customer and product/service base of the enterprise. Focus on ROI improvement of IT - CIOs will find new ways to help customers and the organization profit from how data is used while focusing on managing budgets and processes to eliminate or reduce costs. Inspire the enterprise and expand the business impact of IT - CIOs will have proven expertise in both business and technical facets of their role. CIOs will interact with the enterprise and its executive team as enterprise leaders and drive new business initiatives and shifts jointly the other members of the executive team.